We love stories that bring us beyond the politcal headlines and closer to the country's people. A reader story. 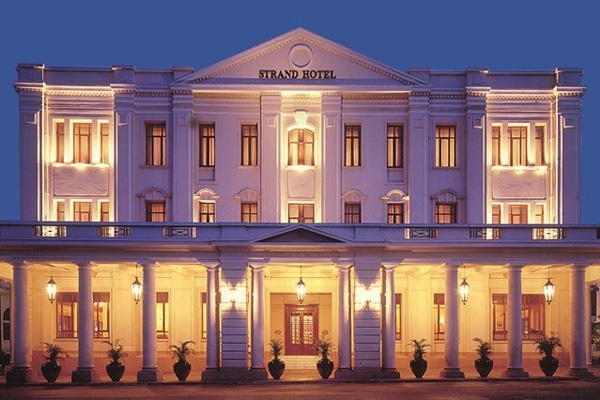 YANGON, Burma – Late in the tropical evening torpor of Yangon, we strolled along Strand Road, named for the venerable Victorian hotel built in 1901 by the brothers Sarkies, who also built Raffles in Singapore. We'd been drinking Pegu Clubs at The Strand bar, playing billiards with a cast of louche characters who might've escaped from the pages of a novel by Graham Greene or Paul Theroux. Happy hour at the Strand on Fridays carries on some of the bibulous traditions established when the Strand was considered "the finest hostelry East of Suez" and a favored haunt of royals, diplomats, and notables such as Somerset Maugham, George Orwell, Sir Noel Coward, and Rudyard Kipling. At the corner, we saw a man seated beneath a tree on a doll-size plastic chair at one of those makeshift restaurants that populate the broken pavement that passes for sidewalks all through Yangon, once known as Rangoon. Seeing us, his face broke into a broad smile, his teeth as white and straight as an advertisement for the benefits of orthodontia. "Come sit with us," he said as he stood to greet us, his hand extended. "What do you want to drink?" We'd met this same man the previous night as we'd headed back to the ship after an evening at The Strand. He and his equally attractive friend had passed us on the sidewalk and then glanced back and smiled. We'd stopped and talked and he'd given us an email address that included lovelymodelboy. He was wearing the traditional longyi, that fascinating sheet of cloth that runs to the feet and is held in place around the waist without a knot, and a tight-fitting oxford shirt open from his neck to the depths of his sternum, revealing a chest of dark hair. He was a swarthy beauty you'd expect to see on a runway in Milan. Burma is a land of contrasts. Officially rechristened Myanmar in 1989, the name Burma is still widely used by governments around the world. One of the most impoverished countries on the planet, the consequence of nearly 50 years of military rule, Burma endures energy shortages and inadequate infrastructure. 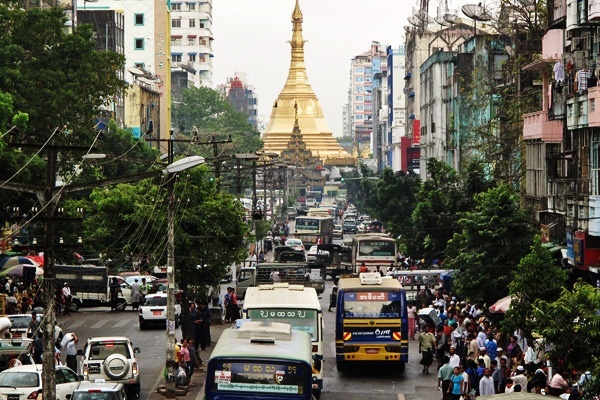 Sandwiched between India and China, the two most populated countries in the world, Burma has a population of nearly 60 million living in a country that is roughly the size of France and Britain combined. Though the country achieved independence from Britain in 1948, vestiges of British rule linger on nearly every corner in downtown Yangon. There are a vast array of colonial buildings, some in desuetude and others, like the Custom House and the Holy Trinity Cathedral and The Strand, have been impeccably restored. This remarkable collection of national landmarks, more than 128 historic buildings, coexists with street fire pots, unpaved roads, and broken sidewalks. "Come and sit down," lovely model boy said, offering us two of the plastic doll-size chairs. His friend was with him, smiling and motioning for us to sit. "A gift for you," he said, offering us two sharpened twigs from a plastic bag that contained scores more, all orderly and arranged like a box of freshly-sharpened pencils. "For your teeth," he said, while showing us how to utilize the sharpened point against our gums. He smiled broadly, his white teeth a testament to the powers of this botanical toothbrush. What was there to smile about? Burma endured three Anglo-Burmese Wars with Britain between 1824 and 1885, as well as the heavy tolls of WWII, when the Japanese defeated the British and the Allied troops launched a series of counteroffensives that ravaged the country. Decades of military rule and oppression were followed by Cyclone Nargis in 2008, the worst natural disaster in Burmese history, which left more than a million Burmese homeless. Earlier that day, our guide on the motorcoach had broken down in tears upon responding to a question about life under the military regime — and her heartfelt soliloquy about the impact on her family had left her listeners stunned and still. And yet, everywhere we went in Burma, we were greeted with smiles and ingenuous offerings of hospitality and kindness. "You are here before this country has been sanitized by tourism," another guide reminded us. The dissolution of the military junta occurred in March 2011: We were witnessing the first stirrings of democracy. 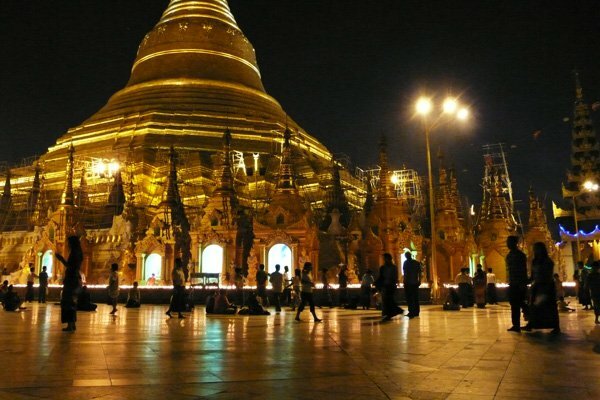 Recent visitors to Burma are similar to diplomats for the rest of the world — and Obama's visit in November 2012, two weeks after his re-election, was the first visit to the country by a sitting president of the United States. 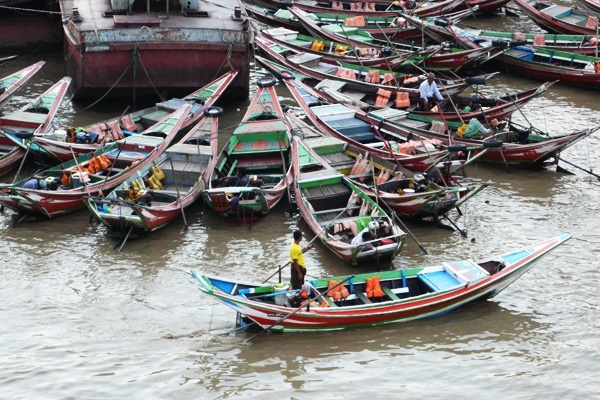 With a 1,200-mile coastline along the Bay of Bengal and the Andaman Sea, Burma has been attracting visitors since at least the 1st century, when sailors, as recounted by Ptolemy, embarked on trading voyages from the Ganges to the Strait of Malacca. Lovely Model Boy's name was Khan, which he spelled out for us the night before on a sheet of paper — perhaps so that we would not mistake it for its homophone "con." He worked in a monastery, teaching English to young monks. "Hesse," he said. "Siddhartha. And Hemingway." He smiled and nodded. "And Dale Carnegie. Do you know him?" Burma's new flag features three stripes symbolizing solidarity, peace, and courage. 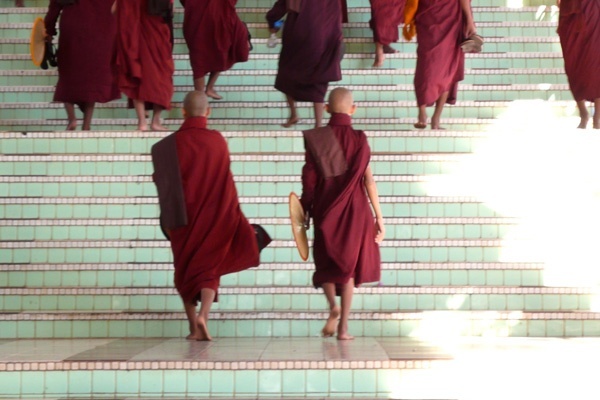 Nearly 90 percent of the population is Buddhist and Buddhist monks were at the forefront of the independence movement in 1948, which was a harbinger to the Saffron Revolution in 2007. In 1961, U Thant, the Burmese diplomat and UN representative, was elected Secretary-General of the UN, a position he held for ten years. After Thant's retirement, The New York Times wrote that "the wise counsel of this dedicated man of peace will still be needed." The same might be said about the many citizens of Burma whose daily practices herald a more humanitarian society. At evening's end, Khan opened his arms wide. "We want to say goodbye like Americans," he said, waiting for a hug. This story ran on MRNY Style & Travel and was republished with permission. Do you have a travel story to share? Fathom wants to hear it. Mark is the author of the novels Wolfchild (2000) and My Hawaiian Penthouse (2007). He has a Ph.D. in American Studies and has been a resident at The MacDowell Colony, Yaddo, and Blue Mountain Center. You can follow him on Twitter at @MRNYCOM. He travels and writes for MRNY Style & Travel and various publications.